During the period of the Great War with France, spanning the Revolutionary and Napoleonic Wars, styles of military clothing changed at a highly accelerated pace, rapidly following equivalent transitions in civilian styles, the profile moving from hats, open lapelled coats and breeches to caps, closed jackets and trousers. This instability could produce real problems for officers responsible at the sharp end, in militia regiments as much as the regulars. Alterations introduced merely at the personal whim of the colonel were not always welcomed. So you are going, I understand, to make a total alteration in the Officers Uniform. I only wish that you may shew as good a taste in your second trial, as you did in the first. For certainly no uniform ever met with more general approbation than our present one has done. Had I been with you before you had come to the resolution of altering it I should most certainly have been Council for the Uniform of the Old Stafford. As it is, I shall say nothing to you upon the subject. Only that when it is done, it should be done in such a manner as to prevent Officers ever wearing the Old Regt in any case (otherwise we shall never get uniform) and I am afraid such an order may come a little hard upon some of our Officers, who cannot afford extraordinary expense. Uxbridge may have decided to change the lace from silver to gold, which would also have necessitated new buttons, epaulettes, gorgets and sword belt plates. In the event these were not altered until 1802, so Sneyd seems to have won the argument for the time being, despite his promise to “say nothing … upon the subject.” I’m not sure what Uxbridge’s first “trial” may have been. Militia officers, who did not necessarily enjoy the private incomes of some of their regular counterparts, could indeed be hit hard by this sort of thing. In 1809 the Lieutenant Colonel of the Shropshire Militia estimated the cost of a militia officer’s outfit – just clothing, sword and belt, exclusive of camp equipment etc – at 57 pounds 7 shillings, equivalent to over £3000 in today’s money. 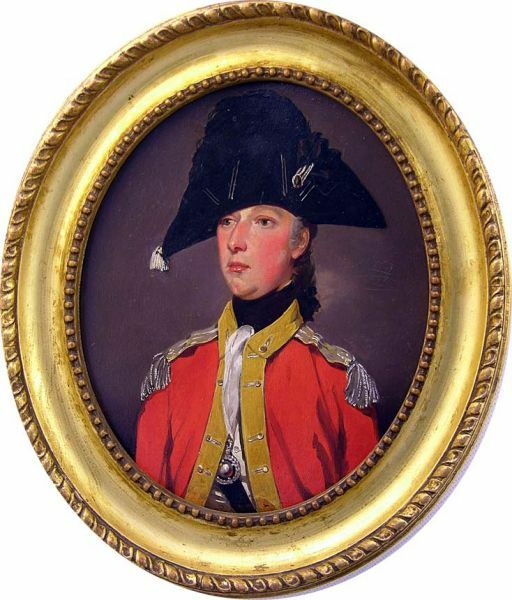 The “Uniform of the Old Stafford” is illustrated admirably in this fine miniature by John Downman, which came up for sale a while ago on the Claudia Hill site. Identified as a Lieutenant Hall, my guess is Lieutenant R G Hand, whose black hat feathers and belt plate suggest the grenadier company. It may have been painted at Warley Camp in 1782. Downman’s later, more sugary, work usually flatters the sitter, but his portraits of this period are frank and telling; he captures perfectly here a blend of vanity and vulnerability. Alterations in the men’s clothing could also create headaches, the clothiers’ cutters not always at their best with a new and unfamiliar pattern. A few years later, in an letter undated but apparently written a little before 1800, Sneyd was obliged to complain to Uxbridge about the transition from coats to the new style jackets, or perhaps from an earlier pattern of jacket to a later, the regiment’s new clothing being “ill cut” and sent late or not at all. Miller seems to have given you an Idea, that we did not understand that the present jackets were made upon a different plan from our former cloathing. That is by no means the case. When I said they were ill cut, I did not mean to object to the plan, which I took for granted was your orders, but that they were ill cut according to that plan. Prater however has now acknowledged that they were not executed according to his wish – which is all he can do. We will therefore make as good a job as we can with them. But I am sorry to say that I have been at last obliged to give way in regard to the old cloaths – and have consented that this Day shall be the last of their wearing them – on condition they are still kept to sleep in on Guard … We still have not recd any more of the Jackets excepting what came by [?]. It is the not receiving them in time that has so totally defeated all our plans. All the fine things for the Blacks & boys of the Band are arrived, but our Taylors are so constantly employ’d & have so much work now before them, that I cannot do any thing about the Bands Cloaths. The guilty party here was “Prater” – William Prater of Prater & Sons, operating out of his “Military Warehouse” at Charing Cross. Prater’s may have had a quality control problem, for in 1803 the Colonel of the Shropshire Volunteers complained that “Messrs Prater have not executed my Pantaloons according to pattern,” and when his regiment was reclothed in 1806 a good proportion of Prater’s breeches were found to be too small, and many items missing from the consignment. In the case of the Staffordshire Militia, the regimental tailors were obliged not only, as usual, to fit the new clothing to the men, but also to try to make good the poor cutting, the extra work setting back the whole schedule for re-clothing, and postponing the in-house tailoring of fancy oriental suits for the black bandsmen. (See also this post.) The reference to the old clothing being retained for use on guard duty is interesting. It was not unusual for army clothiers to cut corners, sacrificing quality to enhance their own profit margins and those of the colonels of regular or militia regiments, who claimed the full allowance from government and pocketed the difference, a regiment still being essentially, as Fortescue pointed out, a private company in the financial sense.